God has given every believer the faith to conquer the world. And in these last days it is more important than ever for you take hold of God’s power and use your faith to manifest his kingdom throughout the whole earth! And that is exactly what you will learn at the 2013 International Faith Conference! Learn from the revelation-rich messages from Dr. Bill Winston, Bishop Tudor Bismark, Kenneth Copeland, Dr. Jesse Duplantis, Dr. Creflo A. Dollar and Reverend Samuel Rodriguez. 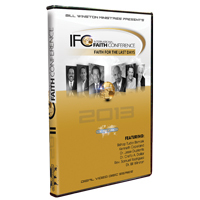 Let the Biblical truth delivered through God’s Generals of the Faith equip you to move forth like never before as you learn how to skillfully yield the power of faith for the last days!